Whether you’re staying at a resort or grabbing a delicious treat at one of the finest restaurants in Branson, farm to table restaurants are some of finest dining spots to enjoy a satisfying meal. If you want to visit a restaurant that serves fresh, delicious, and high quality meats and veggies, try one of the top 3 farm to table restaurants in Branson such as Dobyns Dining Room at Keeter Center at College of the Ozarks, Farmhouse Restaurant, and Black Oak Grill. The Dobyns Dining Room at Keeter Center provides a healthy food, best service, at a reasonable price, with great ambiance and beautiful surrounding. This spacious dining room can seat 257 people. Dining at this beautiful restaurant at the Keeter Center at the College of the Ozarks is one of Branson’s kept secrets. You will never know the place until you see it on the Branson Visitor Channel 5. If you plan to visit this restaurant during peak season, call for a reservation. This restaurant offers guests fantastic Sunday Brunch which includes a breakfast station with scrambled eggs, bacon, sausage, biscuits, and sausage gravy; an omelet station, a carving station with ham and Belgian Waffles; a salad station with made-to-order Caesar Salad, make-your own tossed salad, and a variety of cheeses; a pasta station with two types of homemade pasta, marinara or Alfredo sauce and your choice of variety of add-ins; a lunch station with a beef, a chicken, and a fresh dish, almond green beans, sautéed vegetables, mashed potatoes with gravy, and red bliss potatoes; and finally a desert station with sweet delights too many to mention. Farmhouse Restaurant is another popular farm to table restaurant in Branson that offers a variety of home-cooked foods that are sure to appease your appetite. With the restaurant’s great features of outstanding entrees such as the country fried steak and fried shrimp with hush puppies, customers are sure to enjoy a memorable dining experience at the Branson Farmhouse Restaurant. 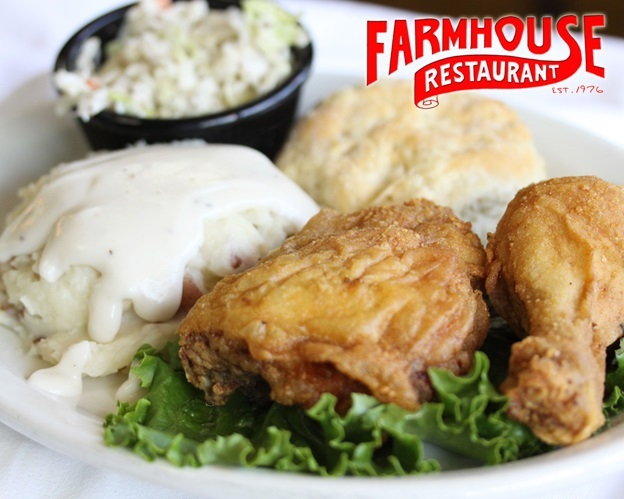 With its unbeatable prices, great service, and memories that last a lifetime, Farmhouse Restaurant is one of the best downtown restaurants in Branson. With so many different choices, ranging from burgers to chicken fried steak, this farm to table restaurant can satisfy any food enthusiast in every meal. Black Oak Grill is another popular restaurant beautifully located at 601 Branson Landing in Branson, Missouri. Known by many throughout the American landscape, black oak tree has a common, distinctive and rich background for the country. Black Oak Grill got its roots from a heritage of urban grills, boulevard bistros, neighborhood cafes and corner taverns. The grill has a bar that features handcrafted cocktails, a variety of fine wines, and premium beers that pair perfectly with the dishes of your choice. This beautiful restaurant is culminating in celebration of American food and leisure. Farm to table restaurants in Branson are some of the finest restaurants where you can eat fresh, delicious, and high quality veggies and meats.